Tasting notes always seem like the easiest thing to write down, but for some reason, I find them peculiarly difficult to wrap up into a blog post. Choosing the appropriate words is not the hurdle – its just breaking down my own inertial propensity for “I’ll just do it tomorrow” and getting it done. Back in May, Mike over at the Mad Fermentationist and I exchanged a few homebrewed beers, including his 5-6 month old Pannepot Clone. This particular beer was most interesting to us, as it was the recipe that Tom and I decided to brew together while he and his family visited us in Rhode Island. During some downtime while brewing our own version of the recipe, Tom and I were able to sit down and taste Mike’s Pannepot Clone. Given below are the tasting notes we took during that sitting. Coincidentally, the tasting [7/11/10] took place 6 months to the day from when Mike brewed it [1/11/10]. (It should be noted that I was suffering from an unseasonable cold during this particular weekend, so the majority of the aroma notes come from Tom’s perceptions, given my disabled nose). Appearance: The beer appeared a deep ruby brown color with an off-white / tan head that dissipated fairly quickly after the pour. The beer was slightly cloudy or hazy in appearance, which is most likely some form of chill haze, as it went away as the glass warmed. Aroma: Dark caramel sugar, assertive alcohol, and dark fruit (plums and raisons) dominated the nose. A hint of banana was detected just after the pour, but was not noticeable later on. Additionally, a small amount of spice (perhaps clove?) and a little vanilla was detected. Flavor: A warming, sweet alcohol is the initial impression that presents itself upon tasting. Not harsh or solventy, the flavor is assertive with similarities to a good bourbon. Behind the alcohol, dark caramel and Belgian candi sugar (dark fruit, sweetness) is also present along the mid-palate. A hint of spicy hop character is also detectable. The beer ends on the sweet side, not overly sweet, but it does not wash away completely and leaves a residual on the tongue. Mouthfeel: The beer is full-bodied, thick, and residual with a warming sensation from the alcohol. 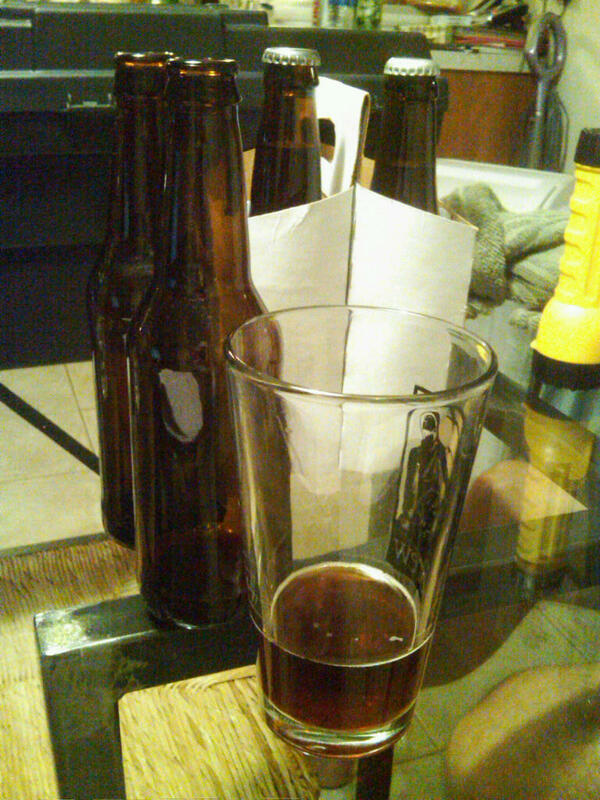 Carbonation was medium and appropriate. Overall: This beer certainly has a broad range of different flavors in one glass. It is certainly interesting to the taste buds and is more of a sipper than a quaffable beer – the alcohol is detectable and stands at the forefront of the flavor, which reinforces it as a slow-drinker. Overall it is very enjoyable and complex. Hope your beer is a success! Sounds very tasty.